While they may be reunited on the plate, onions and potatoes do not make good storage partners. Onions like a dry environment, while potatoes will spoil in anything other than a humid one. Most importantly, potatoes emit gases that accelerate decay in onions. Potatoes need to be stored in a well-ventilated, cool, dark and humid place. Because they continue to "breathe" after picking, they need to be stored in such a way that allows the exchange of gases. A burlap bag works, as does a perforated plastic bag, but never a sealed or airtight container. Potatoes should be stored between 42 and 50 degrees Fahrenheit, way below room temperature. 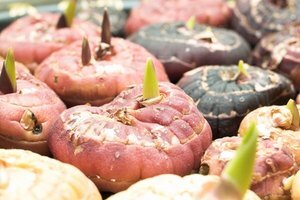 At higher temperatures, tuber diseases can flourish and the potatoes will sprout. 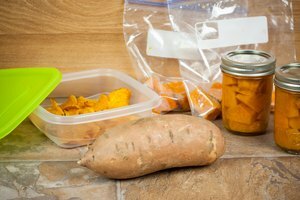 If refrigerated, the starches will turn to sugar and the potato will turn brown when fried. Keep potatoes in a dark, humid spot. University of Idaho recommends a spare room, attic or insulated basement, which is more likely to be humid. Too dry and the potato, which is 80 percent water, will wither and wrinkle. Sprouts are the scourge of the potato, forming between 30 and 140 days after harvest, depending on the potato variety. Light stimulates the chlorophyll in the tuber, encouraging the emergence of sprouts and green discoloration of the flesh. Both sprouts and green spots contain a compound called solanine which is toxic even in small amounts. For this reason, you should buy loose rather than bagged potatoes. 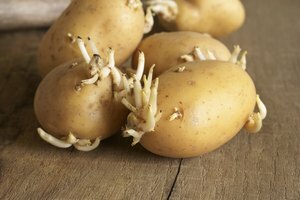 Throw out potatoes that are sprouting, green or show signs of rot. Unwashed potatoes keep longer than washed, because the skin is covered with a natural defense against bacteria. Potatoes usually keep for up to two months if stored correctly, but new potatoes have a much shorter storage life, just over a week. 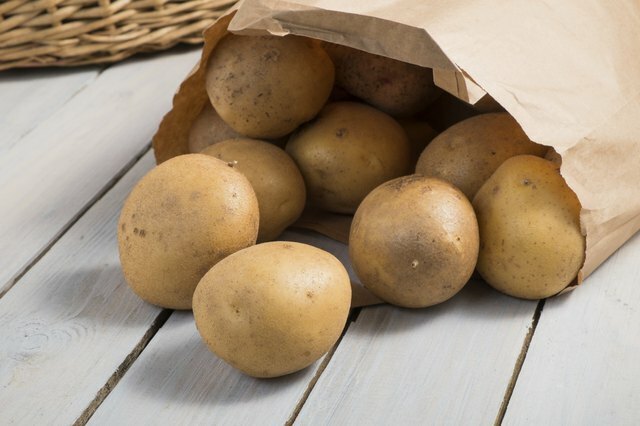 Check the potatoes regularly to remove any that are sprouting or rotting, as these can quickly affect the others. The cool, dry environment where onion bulbs store the longest lacks the humidity potatoes need. Potatoes also emit ethylene gas, which degrades onions, so the two should not be stored together. Keep onions in a well-ventilated container, such as a perforated bowl or basket, raised off the counter so the air can circulate. The mesh bags that onions are sold in work well. Sealed plastic bags will quickly ruin the onions. Most supermarket onions are treated to prevent sprouting, but the skin should also be crisp and dry and form a tight sealed around the neck. In the skin, fresh onions should have no odor. Store onions away from heat and direct sunlight. Room temperature is OK. Correctly stored, yellow onions should keep for a month. Throw out onions that are soft, have visible mold or are discolored. Sweet onions, the milder kind used raw in salads, have a shorter storage life than their more eye-watering yellow counterparts. 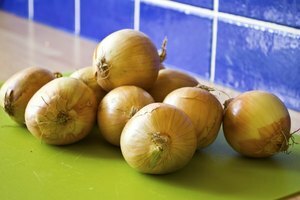 Unlike cooking onions, sweet onions can be stored in the refrigerator, wrapped in paper. Watch out for any bruising, as this will quickly degrade a sweet onion. Peeled onions should be refrigerated below 40 degrees Fahrenheit. Sliced onions will keep refrigerated for a week, but you’ll need to keep them in a sealed container or resealable bag to prevent the aroma making its presence felt throughout the fridge. Once sliced, use onions within a couple of days.